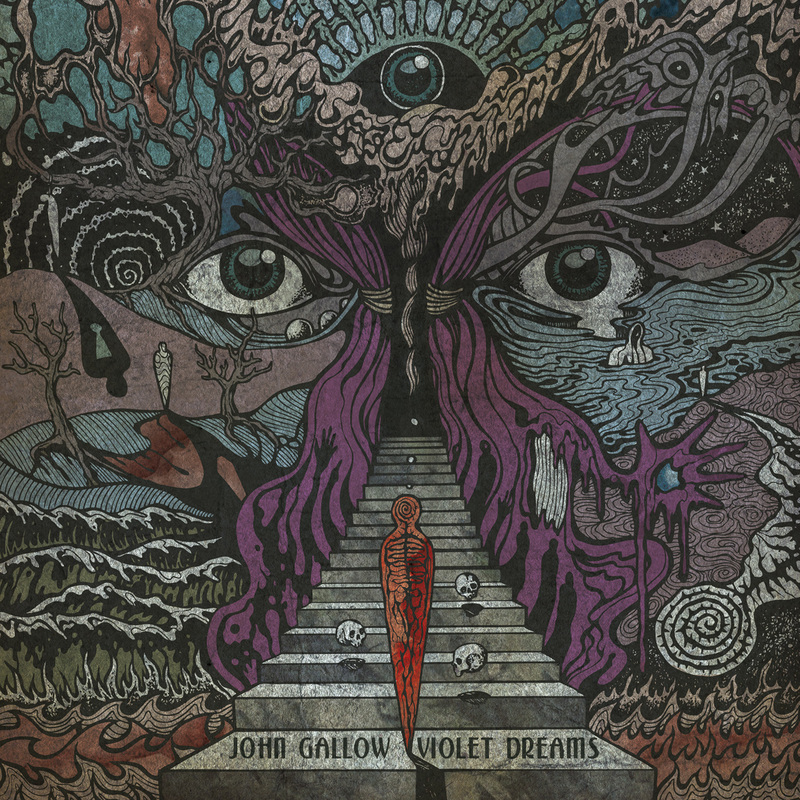 John Gallow is the alter ego of renowned guitarist/vocalist/multistrumentalist John Gallo and his new project is a musical combination in the likes of Paul Chain, early Candlemass and (also) early Black Sabbath. I could end the review here; in fact, I think I gave you a pretty good idea of what this album is all about. It’s haunting psych-doom. And it’s good! It’s like been on acid but instead of multicolor landscapes (and mindscapes…) you have only purple, violet and black ones! Spooky, hah? Well, that’s what you‘ll get. A sinister experience about death and after life, tricky but extremely interesting at the same time. I have to admit, whilst listening to this album, (black, purple and violet) clouds came upon me and left when the listening session was over. That’s doom at its best! I really enjoyed the guitar themes, massive and flawless riffs and with a vast variety of changes. The voice harmonies and falsettos from far beyond make everything more hallucinating and beautifully haunting. Messiah Marcolin and Sabbath’s Ozzy are two names that immediately came to mind during the listening sessions of this album. As stated before, the guitar is simply extraordinary and John Gallo for me is a guitar hero. Also, some of his solos in this album seem improvised and recorded in one take, but that’s just me. Not that this is a bad thing, on the contrary; they fit perfectly in the song structures. There is not one note out of place in this record. This guy is so underrated and should get more exposure, if you ask me. As far as a track-by-track review goes, this album is a trip that should be taken as a whole experience, in which every song is a continuation of its previous and even the instrumental pieces do not fall out of place; they are different parts of the same puzzle. Personal favorites are: “Entrance To The Unknown”, “Violet Dreams”, “Maelstrom Of Consciousness”, “Wall Of Doom”, “Purple Room”, “Lavendeth”, “Burning Trees”, “Beam Of Light”. Most likely this list will eventually change as the scratching of layers of this album continues. You will definitely find something that suits you here, no doubt about it. The great production elevates the (already high) quality of the songs, while the cover art concept makes you familiarize with the album immediately. Great stuff, indeed! Overall it’s a trip within a universe where the evil of man dwells and the souls of the mortals come to suffer, in which you will surely disappear. I know I did. To put it simple, a masterpiece in its genre! ← Interview with Ade Mulgrew of DARKEST ERA ! !